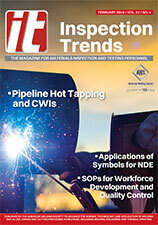 Inspection Trends is a quarterly publication geared specifically to materials inspection and testing professionals, sent to individuals and facilities certified by AWS, including all Certified Welding Inspectors. Subscriptions are also available. If you want to submit an article to be featured in Inspection Trends please contact Mary Ruth Johnsen. Reach influential leaders: Advertise with us! Some of the most active and influential buyers in the industry read Inspection Trends. As active members of the Society, they have a long-term commitment to welding and metalworking. Advertise with us by downloading your AWS Media Kit in PDF format.